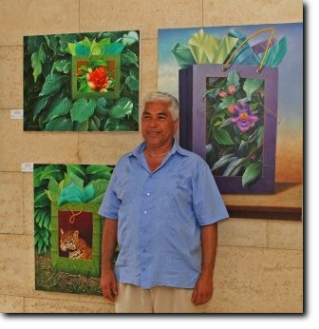 Hernan Pérez was born on November 7, 1951, in the prominent port town of Puntarenas, positioned in the beautiful Gulf of Nicoya. He grew up in a maritime environment full of rich imagery and developed a desire to represent visual phenomena that the sea offered in an artistic way. As a child, Hernan scribbled fishing boats, waves smashing against cliffs, the beach, shells, fish, dolphins, seagulls and images of the estuary and mangroves. Not a day went by where he was not drawing something. In Puntarenas there were no places to buy art supplies, but he began using regular house paints and items he could make himself. This caused him to experiment with masonry pigments or “ocher” in Costa Rica, then mixing them with items such as ground coal, scraped chalk, and pulverized shells. Over the years he began to improve his work, and learned to use his colors to capture the tones and nuances of his subject matter. At 18 years of age he moved to San Jose with his family, and started to paint the rugged landscape of the suburbs of San Jose. Artistic renditions of cottages clustered and staggered, with an almost cubist perspective and exquisite detail were put on canvas.While only working with watercolors at the time, he entered the workshop of the Austrian painter Herbert Birkner, where he learned the art of enamelling on copper and numerous other techniques: acrylic, watercolor, chalk pastel and egg tempera painting on porcelain. With the strong spiritual connection to the earth and living in a country with fascinating ecology, he has become convinced that his art must have a relation to this environment that shapes and molds us. Today, his scenic paintings of nature, flowers, birds, and waterfalls depict his effort to show the viewer a taste of the country decades ago. Watch the slide show from Hernan's opening of "Eyes of the Soul," here. Read about Hernan Pérez in the; and in A.M. Costa Rica, here.